Last week I was in Madrid to speak at a style forum organised by El Aristocrata and visited several of the tailors and shirt makers, including the wonderful Burgos. Carmen from Burgos is actually in New York this week, travelling with the tailor Larrainzar – a classic Spanish tailor who is best known for dressing the Spanish king, and whose father dressed Franco. If anything, Burgos’s client list is even more impressive, including royalty and stars such as Ava Gardner, Orson Welles and Cary Grant. They are at the Hotel W on the 11th and 12th, mostly booked up but with a few free slots. Contact camiseriaburgos@gmail.com. Anyway, Burgos make beautiful shirts starting at around $280 in the US. 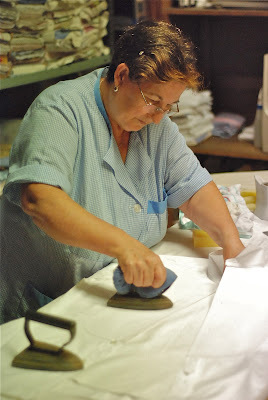 They approach the best of Neapolitan shirt makers in terms of handwork, with collars and sleeves attached by hand (the important things) and buttons and buttonholes sewn by hand as well as the bottom edge of the shirt (lovely but aesthetic details). The shirts are all cut on the premises by José (pictured above) and made by a series of women from their homes. Carmen, the latest generation of the family to run the company (having given up a career in software), does all the travelling but José the measuring in Madrid. They don’t normally do a trial shirt or a minimum order – though the latter does apply on foreign visits. I am having a shirt made, so we can analyse the fit when that’s ready. 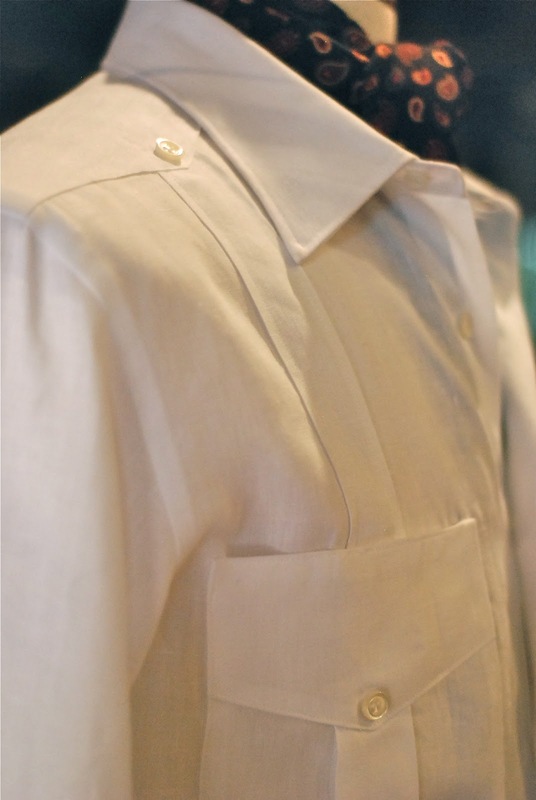 In the meantime, I include some photos of interesting creations, including a frilled dress shirt with superb hand detailing, and a linen safari shirt that Burgos used to make a lot of and has become more popular recently. Apparently a version with French cuffs is worn in Mexico as a jacket suitable for even official ceremonies. 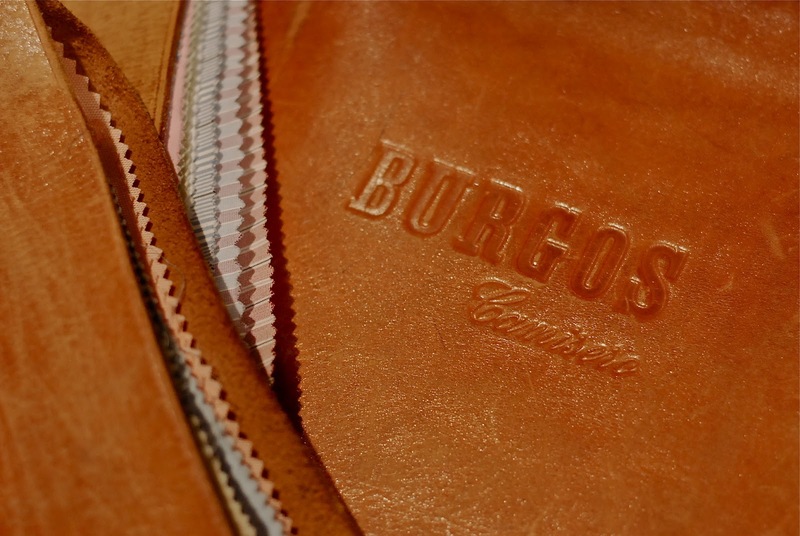 The leather folders containing shirt fabrics date from the opening of Burgos, 100 years ago. Nice patina to them. The dress shirts have a side vent to make it possible to fasten those studs behind a heavily starched front. And Santa, as described on ASW, is the ironer extraordinaire, using old-fashioned irons on those starched fronts. 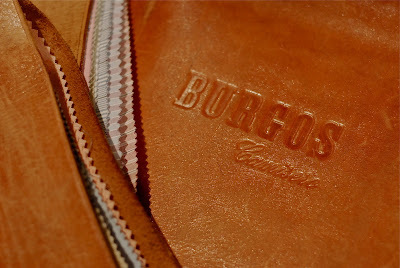 Burgos is also known for made-to-measure teba jackets – the traditional Spanish garment entirely devoid of structure, again like a shirt, except in wool, jersey cashmere and tweed. Again, expect a longer post on those in a few weeks’ time. You can follow the discussion on Burgos shirts, Madrid by entering your email address in the box below. You will then receive an email every time a new comment is added. These will also contain a link to a page where you can stop the alerts, and remove all of your related data from the site. I was in Madrid recently and dropped into Burgos to be measured up. I don’t speak a word of Spanish and they don’t speak a word of English but five weeks later I received a lovely light blue shirt is Spanish cotton. After wearing and washing it a number of times my only two complaints are (1) the sleeves are a shade short (impossible to get right straight away given the amount that cotton shrinks) and (2) the buttons are not sewn on with a shank making the collar and cuff buttons a little difficult to do up. Needless to say I am very impressed given the lack of communication! Also you should note that, as per other shirts of quality, there is a misalignment of seams under the arm. 99.5% of shirts are produced with a continuous side seam which closes sleeve and body. The shirt-body (flat) has the the sleeves (also flat) attached as the first step; then the side gets closed with a seam which goes all the way from the cuff down to the hem. 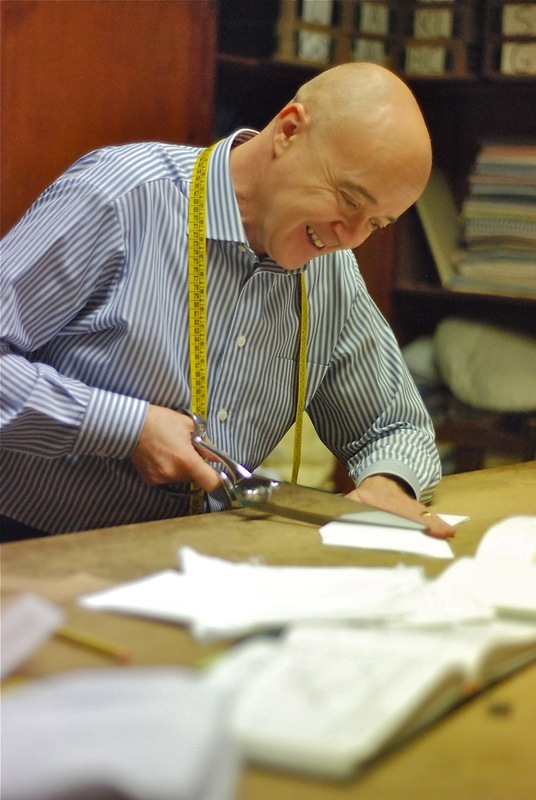 Some of the top Italian shirts (I just checked Barba, Borrelli, Lorenzini) use a different method: body and sleeve get closed separately, then the (round) sleeve gets set into the (round) body. Sleeve- and body seam do not meet, but are separated by about 1cm (1/2”). This reduces bulk under the arms and (presumably) gives a better fitting sleeve head. I couldn’t find any English shirts which use this more complicated method, but unfortunately, I haven’t got any bespoke shirts, to check whether this also applies to English bespoke. The “misalignment” that was previously mentioned by another poster. These sleeves are, in fact, commonly referred to as “pitch forward” in English, or “manica spotstata” in Neapolitan. This can be done for functional (i.e. to balance one’s posture), and/or for aesthetic purposes (i.e. to show that the sleeve has been put in by two separate actions). The shirt you are referring to is called “guayabera”. It is widely used in the Spanish-speaking Caribbean, in Central and in parts of South America and also in Mexico. However it’s birthplace is Cuba, and Cubans wear them more often than anyone else. Yes, it is suitable for parties, ceremonies, funerals, meetings with heads of state, etc. The linen suit in the Caribbean is a myth. Only Europeans and Americans wear them. They are called “Guayaberas” here. The origin is disputed by many countries. It used to be more widely used in the ports as formal/business attire. Now a days, it is still widely used in weddings and celebrations taking place in hot weather. Worn as a shirt not as a jacket.